It would seem that farce is experiencing something of a renaissance at the moment. 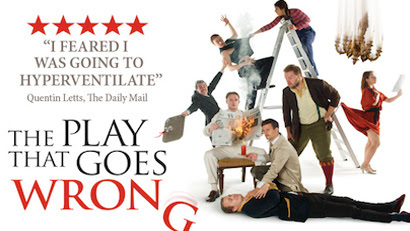 Hot on the heels of the recent national tour of Michael Frayn’s Noises Off and the recent three year run of One Man Two Guv’nors in the West End comes Mischief Theatre’s The Play That Goes Wrong, now developed into a full length production after its highly lauded Fringe debut. Like its predecessor Noises Off, it too is set in the world of theatre but this time it’s the Am-Dram’s turn. After benefitting from a considerable bequest from the director’s grandfather, Cornley Polytechnic Society’s amateur thesps embark on an ambitious staging of 1920’s whodunit Murder at Haversham Manor. It’ll come as no surprise that mayhem ensues as the cast and crew begin to crack under the pressure. The key with any farce is quality, both in writing and acting, in order to work it really does have to be perfect and boy, this is. Replete with sight gags, misplaced props, mistimed lines and badly behaving scenery and awash with every well-known stereotype of the AmDram world: the naïve juvenile lead (Dave Hearn), the leading lady with more chutzpah than talent (Charlie Russell), the doddery old codger reading his lines from his hand (Jonathan Sayer) and the leading man (Henry Shields) whose importance in the company may well be commensurate with the amount of money his family has invested in the society, this is a master class in comic writing and acting. It is a rare sight to see a whole audience in collective hysterics and to hear such a vocal reaction to a piece of theatre. Writers (and performers) Henry Shields, Henry Lewis and Jonathan Sayer and their fellow cast members have pulled the whole endeavour off with considerable aplomb: the exhausting levels of energy required, the cleverness of both the dialogue and the physical gags is to be applauded. The energy, effort and talent here is to be marvelled at in such a young company and a bright future ahead is assured for all. This is theatrical Prozac – do yourself a favour, forget the winter blues and get along to see this while you can.